Hey guys, I’m looking into an FB, and as much as I love rotaries I’m a broke teenager who can’t afford the maintenance, and the trans & engine have 144,000 miles on them, so I was wondering if I could take an L28 out of a 240z and put it into the FB. I don’t know if It would fit but I just wanted to hear from you guys, if any one has experience or links they could give me to help. Thank guys! It would be waaaaay long. Also I would think at this point that a 280ZX would be cheaper/easier to find than an FB since S31s are still pretty much worthless, and SAs/FBs are probably the only Japanese 2-seaters that rusted harder than Datsuns. I know people have swapped RB20DETs, and the RB engine is a DOHC version of the L-series, so that would be a place to start if you're serious. The RB did not look like a fun experience. I got this from google. 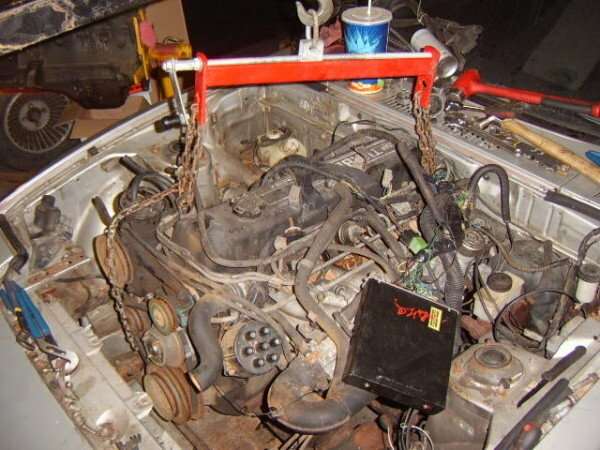 You might see how this measure up to the engine bay. Don't forget heavy as all hell. V8 swaps are generally lighter. And unlike in that photo, it allows you room for a radiator. Inline sixes are not a light design. Even with a magnesium block (BMW) they aren't particularly light. 240Zs had one of the flimisest, weakest, thinnest-gauge shells I've ever seen, and they still weighed over 2000lb because over a quarter of that weight was the engine. For reference, a 4 door RX-3 was lighter, even though it had about the same dimensions, a much sturdier chassis since it had a leaf sprung rear suspension that required reinforced sills instead of the S30's inherently light central spine arrangement, AND the RX-3 had four doors and seating for five. Last edited by peejay; 03-26-19 at 09:21 PM. Quick Reply: L28 into an FB?